I have been in education for the past 23 years, serving as a teacher and administrator. I have been with the Porter Township School Corporation for the past 19 years. Being a part of this district has been a big part of my life and the people within it are like a second family to me. My academic background includes a Bachelor of Science in Mathematics Education from Indiana University and a Masters in Educational Leadership from Ball State University. In my free time I enjoy spending time with my wife and three children, exercising, watching football and doing word puzzles. 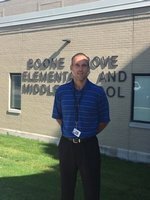 I am excited for this year and to be a part of the Boone Grove Elementary family!